Winters in Wyoming are obnoxiously cold. I’ve been joking with everyone that it seems more like Hoth around here. And with my job, I’m usually out in it when it decides to blow 30+ miles an hour icy death winds. 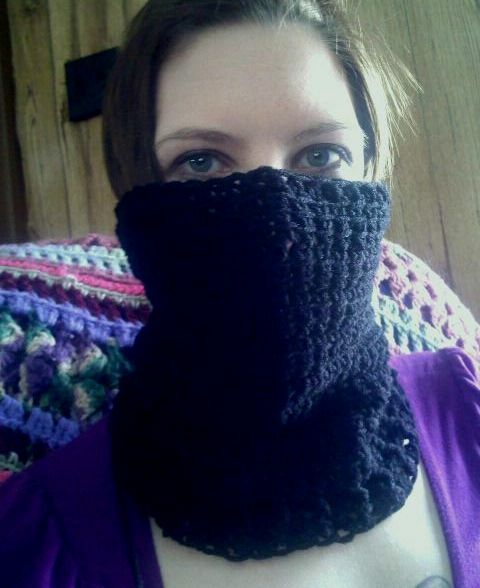 I decided I probably need to make a cowl/face warmer to help block out some of that nasty wind. I made ninja jokes all night. It’s an easy enough pattern! So I thought I’d share it with everyone. next row: ch 1, turn. 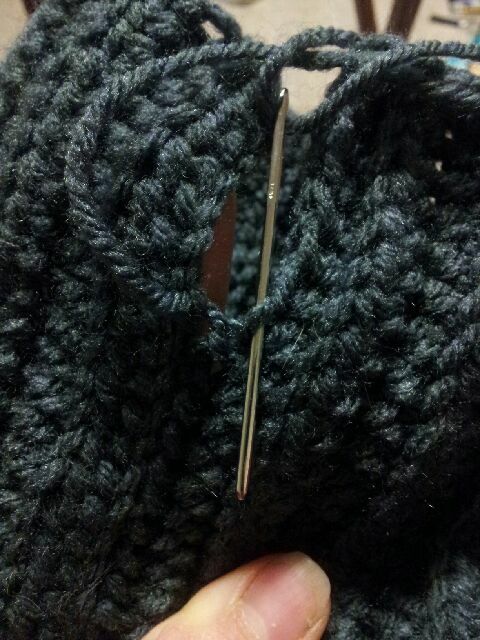 hdc to last 15 sts, skip these sts and ch 17.
turn, single crochet in 3rd ch from hook and each st in blo across. thread onto sewing needle,and sew last row made to first row made. Finish off, weave in ends. And waa-laa! 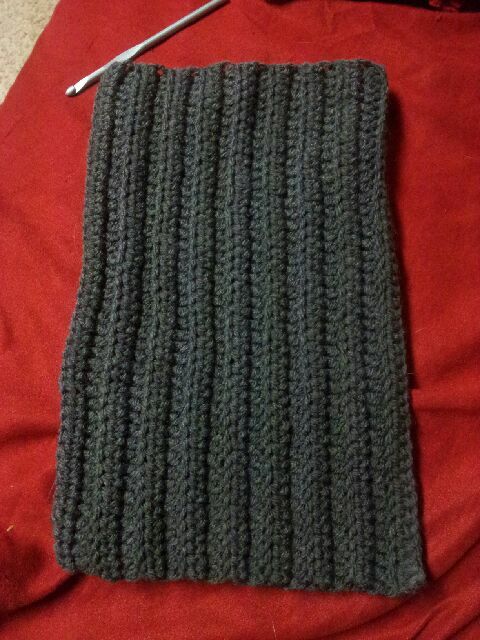 A nice warm cowl to keep out the winds of Wyoming. 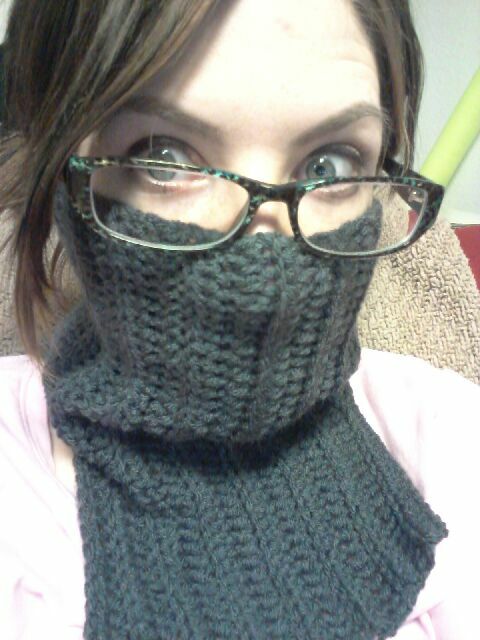 Wind Cowl, or, I’m a ninja!! 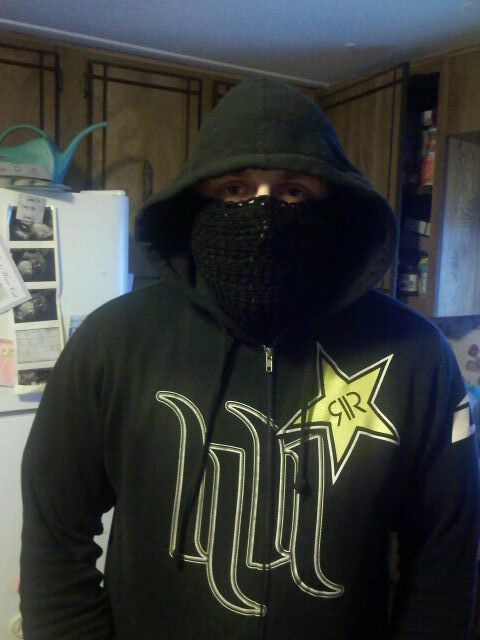 I look like a ninja! hehe. 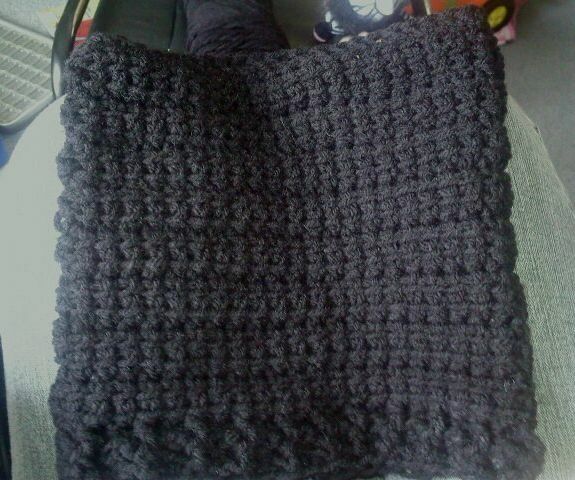 I used linked treble crochet to make it quickly but at the same time thick and less hole-y. WW Yarn-I used good ol red heart again. 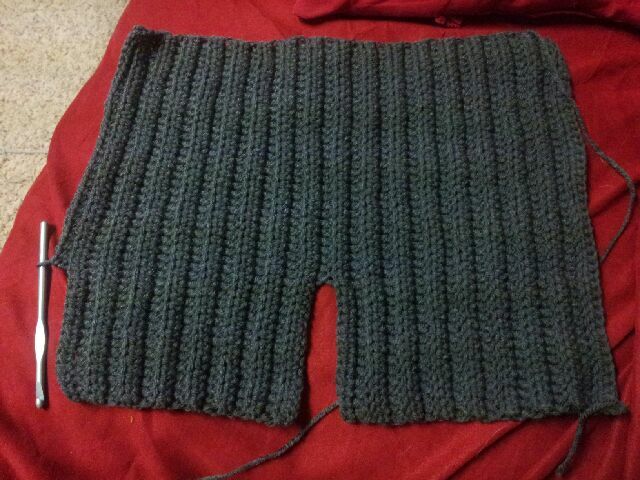 Maybe half a skein, though I’m pretty sure not even that much. Working in foundation double crochet, do 45 foundation double crochet. (first ch 3 of foundation double crochet counts as first dc) Join to top of first double crochet. Round 2: Ch 3, yo & insert hook into 2nd ch, pull up a loop, yo & insert into 3rd ch, pull up a loop (3 loops on hook), insert hook into first dc, yo & pull up a loop, finish as normal treble crochet. This starts off your round of linked treble crochet stitches. Work rest of round in linked treble crochet. Join to top of ch 3. 45 sts. Repeat round 2 seven more times. Next row: Ch 2, hdc around in the back loops only. Join to top of first hdc. You’re now going to break your yarn, leaving a nice long tail to sew. 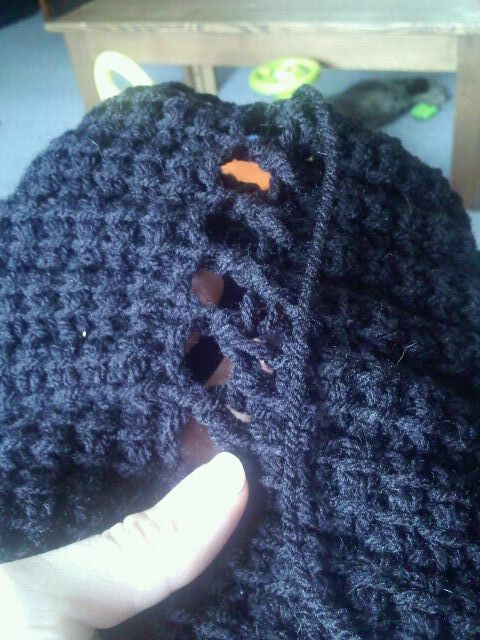 There will be gaps in between where you joined the linked treble crochet rounds down to the post stitch ribbing. Thread your yarn tail onto a sewing needle and stitch sides together. 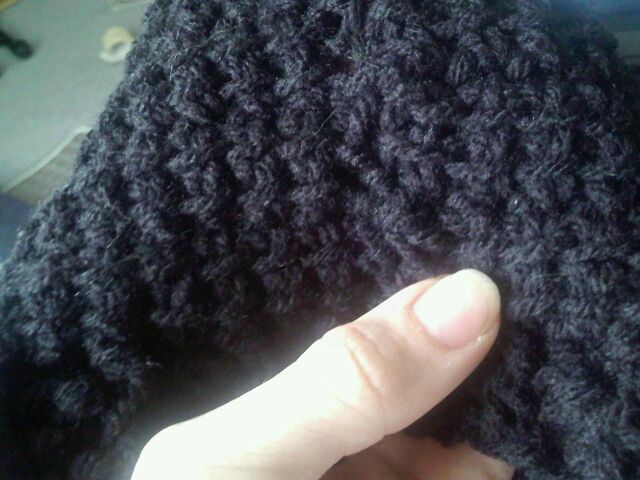 I stitch similar to a mattress stitch, so I can have a reversible cowl. See? Gaps. Bad for blocking wind. After sewing up the gaps. Much better! Either side can be the right side. If you like the looks of the dashes from the linked trebles, use that, or the other side is completely smooth. Your choice! Weave in ends. Show off your ninja skills.